Painkiller Jane Was Once Going to be the First Movie Of Its Kind. Now It Just Hopes Ghost in the Shell & Atomic Blonde Haven’t Soured the Market. 2 Comments on Painkiller Jane Was Once Going to be the First Movie Of Its Kind. Now It Just Hopes Ghost in the Shell & Atomic Blonde Haven’t Soured the Market. 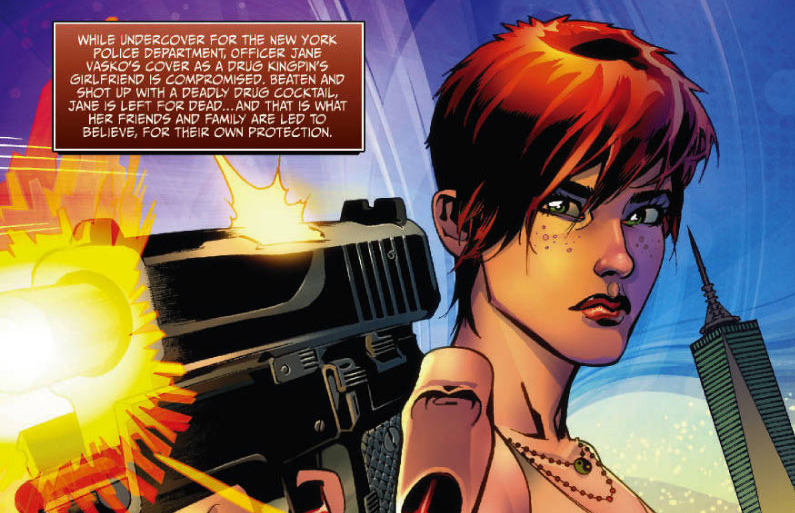 At one point, Painkiller Jane, a film adaptation of Jimmy Palmiotti’s graphic novel series that plays like Deadpool crossed with Jessica Jones, was on track to hit screens before Wonder Woman, Captain Marvel and any other female-led superhero movie in this current generation. That, um, didn’t happen. Stupid development hell! However, the production appears to be finding its legs again. Jessica Chastain is attached to produce and star, and according to Deadline Lotus Entertainment has hired Christine Boylan, a veteran of comics (Punisher, Hellblazer) and TV (Once Upon a Time), to write the script. After debuting in 1995, Jane has been relaunched multiple times by Palmiotti, who has since gone to extreme fame (in comic book circles) for writing DC’s various Harley Quinn books with his wife Amanda Conner. There was even, briefly, a Painkiller Jane TV show on SyFy. 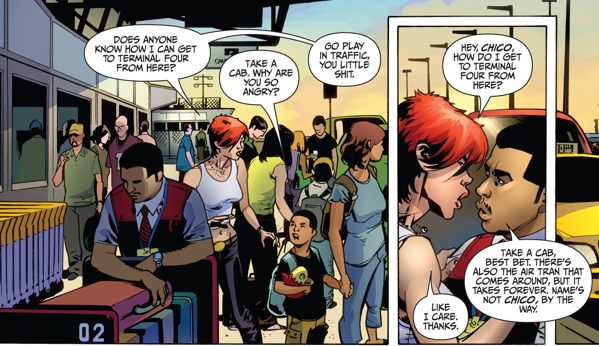 However, in 2014, a time when fans seemed to be thirsting for harder-edged, female-led comic book entertainment, Jane seemed like an ideal property to develop for the big screen, especially as the bigger boys at WB and Marvel Studios were dragging their feet (Wonder Woman finally arrived in 2017; Jessica Jones in 2015 for Marvel TV, and Captain Marvel due in 2019 for Marvel Studios). So, Painkiller was first announced at San Diego Comic-Con 2014, at which point it was meant to be directed by the Soska twins (See No Evil 2) from a script by Craig Weeden and Palmiotti. The intention was to make it as an R-Rated movie, and that was well before Deadpool had come along to make that cool again. Then nothing. These things always take longer than you expect, and usually morph into something very different than what was originally intended. However, after years of radio silence it was safe to assume Painkiller was dead. After all, a fellow R-Rated adaptation of a graphic novel about an action heroine, Atomic Blonde, was announced a year later than Painkiller, and was in production within 12 months. That’s the power of having a star attached, in that case Charlize Theron, versus not having a star. So, Painkiller apparently gained what it needed when Chastain, who might soon find herself in another Oscar race thanks to Aaron Sorkin’s Molly’s Game, hopped on board. Though best known for meatier roles, Chastain does occasionally dip her toes into blockbuster waters, co-starring in the ill-fated The Huntsman: Winter’s War and set to play the villain in next year’s X-Men: Dark Phoenix (or at least the villain until Sophie Turner’s Jean Grey becomes the Dark Phoenix and thus the true villain). Painkiller Jane is her chance, though, to finally play a superhero, which has apparently been a dream of her’s for quite some time. However, even with her invovlement it’s still taken nearly a year to jump from her involvement to hiring someone to write a script. Basically, fingers crossed, but don’t give your hopes up. Why this matters is because everything that once made Painkiller unique has since been taken away from it by virtue of similar projects (Wonder Woman, Jessica Jones, Deadpool, Atomic Blonde) ending up on screen first. However, for Hollywood’s recent diversity initiative to be sustainable and not just another short-lived wave everyone was copying off of there has to be room for more than one of the same kind of thing, and failure or merely modest success should not automatically kill similar-sounding projects that are still in development. There’s no reason that a Painkiller Jane movie starring Jessica Chastain (and written by a woman) couldn’t do something similar. The market conditions and various other factors will determine if Painkiller ever manages to leave development hell, and a film at this level will be especially dependent on convincing financiers to make the investment. Hopefully, then, the money people don’t already see this female-led action movie thing as a fad with little or no upside, or a marketing gimmick that has been pushed so hard it’s already created a backlash. Here’s hoping Christine Boylan will put together a killer script to silence any of the doubters. I have always wanted to read PKJ but never bothered. I think there was a Terminator crossover that started my interest. I wonder if there is enough space in the market for the smaller or independent (of Marvel and DC) brands. Before superhero fatigue sets in. Apart from Kingsman, I can’t immediately think of a non-DC/Marvel comic book property that has really broken through. The better route for those lacking the backing of a Disney or WB seems to be to simply head north and turn your comic into a TV show for Canada/SyFy. But, of course, Painkiller Jane already did that and didn’t make it past its first season. So, this is the best option, though I wonder if Chastain is going to be a big enough name to get it made. She’s a name, for sure, but not a bankable one, not like Theron was after Fury Road.